I should have posted this sooner but you know how that goes sometimes...Sorry! Any who, my children have always enjoyed an advent calendar. In the past we have done the typical store bought ones...you know the ones with the door to a piece of candy, then we moved to a beautiful antique number with numbers on little doors and only big enough for coins, paper, or tiny chocolates and candy (but the excitement of the treasure what still BIG) then we advanced our advent tradition to small packages. As Pookie and Little Einstein have grown and with almost five years between them (didn't plan it that way but with a hip replacement and fertility issues...) I had to find a way to make it fun and interesting for both children. After talking to a friend she shared what she does for her children (who are the same ages as mine), thanks for sharing Anne. Using small packages/bags was the perfect answer. I found these adorable Santa Bags at the ever so fun and fabulous Target. They are the size of a typical brown paper sandwich bag and the Santa flips up to insert your Advent treats. To each bag I added a Scripture, each one leading into the next, ending with the birth of Jesus. Of course each bag also has a fun treat. As I explained to my children, some days may have one treat to share and some days may have one for each child. I love the days with one item that encourages them to play together, for those days I found: magnetic checkers (day number 2, after I bought it I found out it wouldn't fit in the bag and had to wrap them), wooden tic tac toe games, notepads with games pre-printed on them, mini table tennis and on and on. I also did a few Christmas movies and note for Family Movie and Pizza night. Some of the individual treats I found: light up Rudolph noses (those should make some cute pictures), finger moustache tattoos (so funny), ear buds, itunes cards, notes with trip to get frozen yogurt and see Christmas lights, hot chocolate mix and spoons dipped in chocolate, and more and more. After laying everything out and strategically placing the treats in order I put them all in this gigantic basket we have. Closer look of the bags, I found the numbers in my workroom left over from a school project. I'm sure I could have found pretty ones at Hobby Lobby or Michael's but I had these, so why not. I know I dropped the ball on posting this and again I am sorry. There is still time and children will not care if you missed a few days, they love the idea of a fun tradition and special treat. A quick note (since I mentioned Target), I went bright and early to the crazy that was Target this Saturday for the Neiman Marcus big release. A friend, Shannon convinced me to get up before daylight ( I never sleep so why not), drive to her home (jacked up on caffeine), then rode to Target together to stand at the doors basically chanting "open, open, open." Yes we bought a few things, but I would say overall we were both disappointed. Not as fabulous as all the hype. Oh well Shannon and I had a fun day of holiday shopping and giggled all day about our early morning field trip. I picked up a few things for my master bedroom make over, new slipcovers are in the works (thanks www.michellefritz.blogspot.com, it was great seeing you Friday, your talent amazes me), I have narrowed the bed down (now to have it made) and found the mirrored chest for nightstands. Sconces and Chandelier are hung and beautiful...now I need to be patient and it will all come together. I must say I can see perfectly with my light bulb exposed at the moment...hahaha! I'm sure they will be back together soon...I hope so I have a Charity event/fundraiser at my home sooooooooooooooooooooooooon. 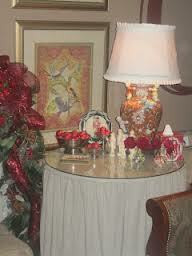 The picture above is of Michelle's work, she made the table skirt and lamp shade. I love to give a gift, the shopping for the perfect present, the excitement of the recipient, all of it. So during December I am going to see how many give aways I can do. So check back , you never know what I may be giving away. Contest ends Tuesday, December 4, 2012 at midnight. Open to US residents only. The last winner of the Kate Spade Bracelet was Janie (she's been contacted). Such a fun idea for Advent! And I neeeed those notepads because I'm a total list maker! Adorable! I would have the cutest lists on the block! I knew your kids would enjoy them as much as mine do! Cutest Advent calendar...love!!! I totally need the notepads, almost out of my Erin Condren. WOOHOO!!! very cute and original advent calendars and i love stripes & kate spade! Love that idea, its always so hard to find tiny gifts to fit in our advent calendar. that's a great idea, why didn't i think of that sooner. Love the notepad, stripes melt my heart! Hope all is well, and no more anonymous. jennifer K (you have my info). What a great idea to share the giving season with your readers--that's so thoughtful! Of course, I'm a fan of anything Mrs. Spade has to offer and these are no exception! Too cute :) Thanks for hosting! I can't wait to see your finished room. I know it will be amazing. I love your blog and Kate Spade! I hope you do a master bedroom reveal! Love your posts, and so looking forward to the big reveal!! !